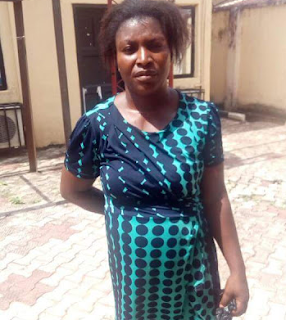 A Federal High Court sitting in Enugu has sentenced a woman, Onwe Nwakaego, 25, from Abakpa Nike Enugu, to six months imprisonment without the option of fine, for child trafficking. Two defendants, Onwe Nwakaego (f) and Onwe Ifeanyi (m), were arraigned on January 17th 2018 by the National Agency for the Prohibition of Trafficking in Persons (NAPTIP) for engaging a 7 years old child as a domestic worker, an act contrary to Section 23 (1)(a) of the Trafficking In Persons (Prohibition) Enforcement and Administration Act, 2015. After listening to the defendants and the prosecution, and viewing the necessary documents presented by the prosecution as exhibit in the case F.R.N Vs Onwe Nwakaego& Anor, the presiding Judge, Justice Abdullahi Mohammed Liman, found the first defendant guilty as charged and she was sentenced accordingly. However, the second defendant, Onwe Ifeanyi pleaded not guilty and was subsequently admitted to court bail. The Director-General of NAPTIP, Dame Julie Okah-Donli expressed her happiness over the conviction and used the opportunity to reiterate the Agency’s resolve to stamp out child trafficking and its accompanying forms of exploitative labour from Nigeria. She warned the general public against employing children below the age of twelve as domestic workers, or engaging in any form of child labour or abuse, as she said the arm of the law will catch up with anyone who does such. The NAPTIP boss further called on members of the public to report any suspected case of child trafficking and abuse to NAPTIP.